The most recent record is listed first, followed by the previous records. * Note: As of the 2007 record, Guinness has changed the wording of the line dance world record. Previous world records were called "World's Largest Country Line Dance". Their website now refers simply to 'largest line dance'; the word 'country' is gone. "The largest line dance involved 17,000 participants who performed the Cupid Shuffle for 8 minutes at the Ebony Black Family Reunion Tour in Atlanta, Georgia, USA, on 25 August 2007." Congratulations to all those linedancers for setting the current record! "A gathering of 12,168 line dancers took place at the Happy Valley Recreation Ground, Hong Kong on 29 December 2002. The attempt was organised by The Community Chest of Hong Kong, the Hong Kong Dance Federation, the Home Affairs Department, Leisure and Cultural Services Department and Television Broadcasts Limited. They danced to 'Baby Likes To Rock It' for 7 min 40 sec." Oddly, Guinness failed to mention the name of the line dance used, but I asked the right person in Hong Kong and I found out that the line dance used was "Baby Likes To Rock It" by Hillbilly Rick. This is still the largest record for "Country Line Dancing" since the Atlanta event was a style of linedancing classified as "soul line dancing". 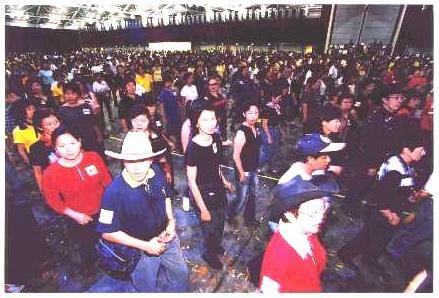 The line dancers of Singapore and some from neighbouring Malaysia showed up en force on May 1, 2002 at the huge Expo Center in Singapore. It was an awesome sight. That word "awesome" is overused nowadays, but it could not be more appropriate here. Imagine 6 or maybe 8 football fields worth of dancers quite closely packed. There were sections with school kids who learned to line dance in their P.E. classes. And many seniors were present. Just about every line dance instructor brought almost all their students. The line dance chosen for this attempt, Singapore Swing, was choreographed by Bill Bader of Vancouver, British Columbia, Canada who was flown in for the project to help leading the crowd and teach a dance workshop afterward. Accountants were hired to monitor the world record attempt and verify the numbers of dancers. The official counting needed to be done before all 13,500 ticketed dancers understood that they were in their designated spots, as it was 20-30 minutes prior to the actual excitement of dancing for the record. But once everyone gathered, it was an amazing sight. Huge video screens around the huge space were used to project the dancing so that all could see, alternating between those of on the stage and those thousands on the main floor. Guinness World Records recognized this attempt as the official "World's Largest Country Line Dance" with 11,967 line dancers according to the letter received by Mr. Peter Ng of NTUC Income Cooperative in Singapore, the main corporate sponsor of the world record attempt. Whatever the official numbers were - versus what the ticket numbers told - it was certainly a hugely successful charity fundraiser; at $2 a head, there was a whopping $27,500 raised for the Heart Fund, topped up to $30,000 by NTUC! On the following day, the front page of Singapore's major newspaper, the Singapore Straits Times, had a big photo spread and very supportive article. Sources: Bill Bader, Mr. Peter Ng. Line Dancing World Records were set in 6 consecutive years (!) in the small but dynamic town of Tamworth, New South Wales, Australia. 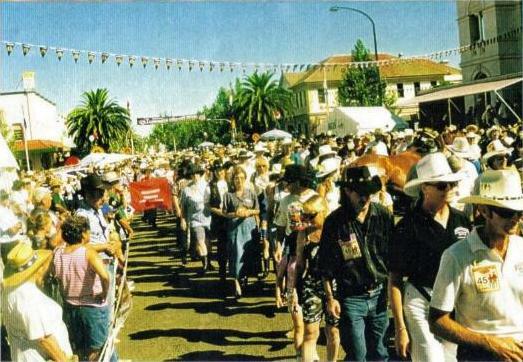 There, for the past few decades, they have held the Tamworth Country Music Festival. 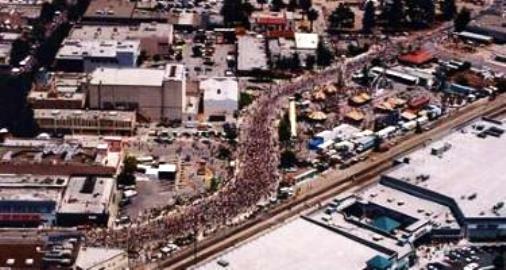 Starting in 1997, in conjunction with the music festival, organizers arranged for the "Longest Line" event -- the town closes it main street for 8 blocks or more, line dancers gather together on the morning of the last day of the festival (Sunday), and the participants try to set the world record. This attracts a large percentage of the 10,000-30,000 people who attend the annual festival. Grizzly Adams hosts the Longest Line, and Julie Talbot, well-known line dance instructor from the Sydney area, does a quick lesson of "Boot Scootin' Boogie" choreographed by Bill Bader, a line dance that most Australians learn in their beginner classes. "Cowgirls Twist was performed by more than 3700 dancers on July 4, 1996 in Redwood City, CA in the San Francisco Bay Area. This won the 1996 Guinness World Record for the World's Largest Line Dance." Source: linedancefun.com/timeline.htm and Evelyn Khinoo (photo). 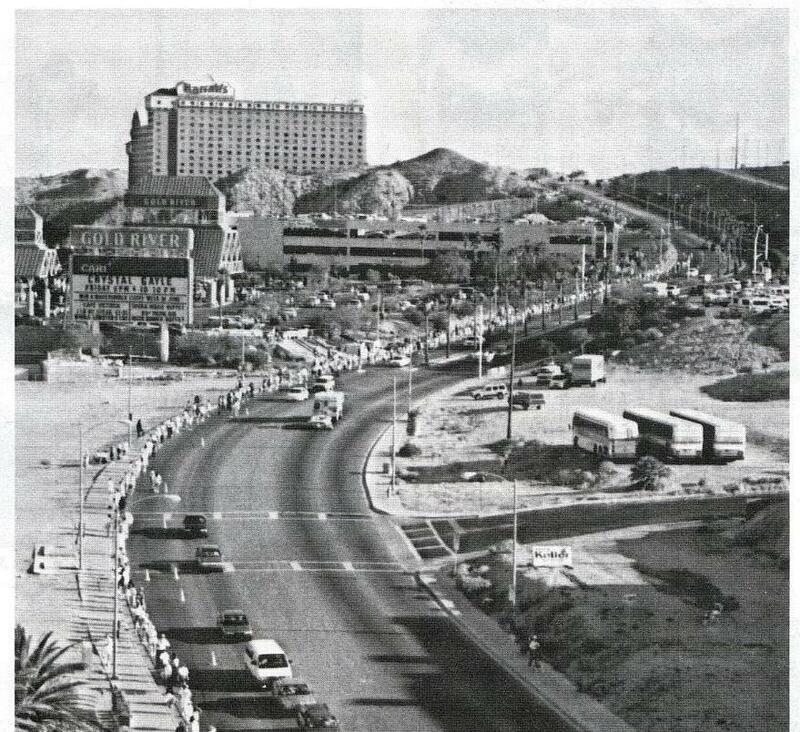 Laughlin, a small town south of Las Vegas, was the site for a very large (and long) line dance event in in the early 1990's. Estimates range from 8,000 to over 10,000 dancers. But this event was not submitted for recognition by Guinness World Records and did not have the necessary monitors to verify the attempt. This in no way negates the obvious size of the event. The dance used was "Jungle Jam" choreographed by Charlotte Skeeters. Source: Charlotte Skeeters, one of the organizers of the event. © Copyright 2007-2015 Bill Bader All rights reserved.